This is a meme that has started doing the rounds. Normally my "competitions" are a joke, but this time for real. Name all the influences, and win a sketch. Alright, I think I have it all! lol just missed Hemal, nice try though. Drew-email me your mailing address, and I will get that sketch out to you. I can't make any promises, but do you have a preference? How the hell did you guys figure out James Whale? Good grief. I just spent the last hour trying to figure out what I now know to be Joseph Coll. I found Whale pretty fast. 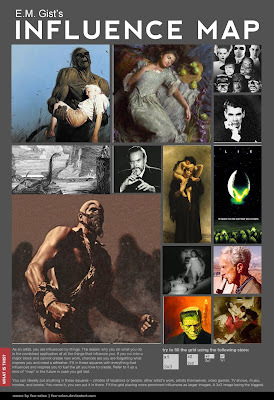 Black and white horror monster movies in google. I thought it was Colin Clive at first but after searching him I found the picture of Whale. Cornwell gave me a bit of trouble too. I was all over the map searching Pyle, Leyendecker, etc. I knew it was one of those guys in there. The hardest one for me was Bonnat. I googled woman with child painting which lead me down a rabbit hole that ended with Bonnet. Lot of fun and here I thought I was the only one home on a Friday night. hahah Drew I used Tineye as well and got that image "frank35.jpg" I was searching all over for directors named Frank, and then it finally hit me - FRANKENSTEIN hahaha. I was waiting for the answers, hah. All I wanted to know was who's the second artist. Morgan Weistling, he's great. Erik, remember today when I mentioned the coming war with the machines and you said it was the nerdiest thing you had ever heard me say? When I saw "influence map" I wondered why you would be blogging about an array of numbers that maps the amount of influence a deformation function has onto a set of vertices. We use influence maps all day long in 3d animation. Also Hemal... so owned man.